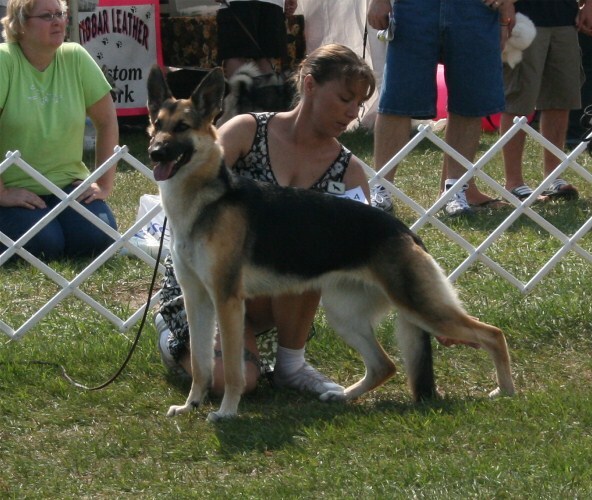 "Ava" is the pick-of-the-litter pup who I had to give up for stud fee. I guess the only reason I let her go is because the stud dog owner is also my best friend, partner & family! Ava is such a delightful and charming young lady- she brings joy to everyone she meets. Ava is playmate to two treasured children, Brianna and Brendan-- and also the Juniors dog for Brianna- here, on the right, she is showing off her first ribbons with Ava when she was a wee pup! Even though we're just "Out of the gate" in this photo, you can still see that Ava has inherited the perfectly clean movement of her mother Hollie, and many generations before her. 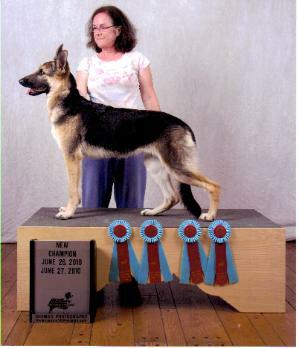 It is such a pleasure to have a GSD with a shoulder & elbow that reaches to full extension, and good ligamentation throughout- no matter how fast she's going, it looks as if her feet never leave the ground, yet never touch it! She has the prettiest, tightest feet, a gift from her father, along with her coat pattern LOL. Ava carries for solid black from her mother. 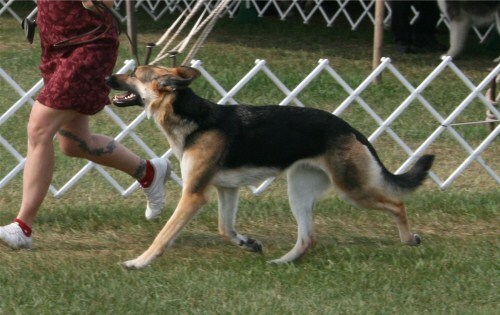 Best about Ava is her awesome temperament! She is just such a sweetheart! As she doesn't live with me, I don't get to see her every day. But when I do, she is so overjoyed to see her "Mema"; it seems she'll always know me, the person who caught her when she was born, whose hands she took her first breath in... she gets so wiggly, and she "sings" out her happiness to see me! What a silly girl! Ava has the gentle sweetness of her mom, the I'm ready to do anything attitude of her dad, and the balance of all and the socialbility from her kind family she lives with. We are looking very forward to her getting her OFA Hips & Elbows and PennHIP testing done around early January, for a breeding to take place in late April/early May, 2012! 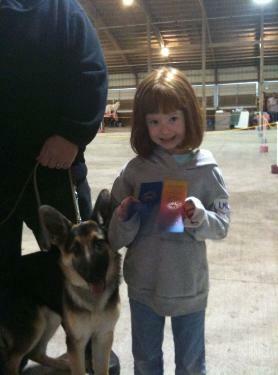 Ava earned her UKC Championship with her co-owner at only 7 months old!